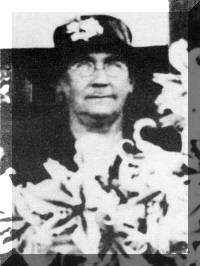 3-May Rebecca Walker was born on 10 Apr 1877 at Spring Rises, Exton and died on 1 May 1947 in Launceston at age 70. May married her first cousin Arthur William Walker, son of Samuel George Walker and Sarah Crawford, on 5 Feb 1901 in Westbury, Tasmania. Arthur was born on 18 Nov 1872 in Westbury, Tasmania and died on 11 Jun 1961 at age 88. They lived at first at Penguin, but moved to South Riana about 1904, living in a two room cottage until later, when Samuel Walker (Arthur's father) built them a four roomed house. Arthur worked for a Mr. Fielding for about 10 years before buying his own farm. At that time most of the land there was overgrown bush, with only mud tracks and no shop. Arthur farmed there until his retirement, when his son Stanley took over the farm. May and Arthur retired to live at Penguin. May was organist at the South Riana Methodist Church and Sunday School for over 30 years. She also taught in Sunday School as did her husband and son Hector. Hector was also a local preacher, and his wife Zillah a Sunday School teacher. Doris, another of May's daughters-in-law, was also a church organist. It has been said that May was rather firm, and that her husband did not let her know that he purchased tobacco. 4-Hector Allen Walker was born on 11 Jul 1901 in Penguin, died on 13 Feb 1982 at age 80, and was buried in Feb 1982 in Penguin. Hector married Zillah May Crawford, daughter of Arthur Stephen James Crawford and Edith Caroline Sushames, on 28 Jun 1933 in Penguin. Zillah was born on 7 Apr 1907 in West Pine Road, Ulverstone, died on 30 Aug 1996 in Tasmania at age 89, and was buried on 3 Sep 1996 in Penguin. They had three children: Dorothy Edith, John Allen and David Stanley. 5-Dorothy Edith Walker was born on 28 Aug 1934. Dorothy married Ronald Cohen on 28 Mar 1964. Ronald was born on 17 Mar 1934. They had four children: Gregory Ronald, Darren allan, Richard George and Anthony Arthur. 6-Gregory Ronald Cohen was born on 30 May 1967. 6-Darren allan Cohen was born on 10 Sep 1968. Darren married Rachel. 6-Richard George Cohen was born on 22 Jan 1972. Richard married Diane. 6-Tony Arthur Cohen was born on 3 Dec 1973. Anthony married Helene. 5-John Allen Walker was born on 17 Oct 1938. John married Mary Hope Sturzaker. Mary was born on 8 Sep 1930. They had three children: Vicki Rae, Karyn Lyn and Kerry John. 6-Vicki Rae Walker was born on 5 Sep 1959. 6-Karyn Lyn Walker was born on 9 Aug 1961. 6-Kerry John Walker was born on 9 Aug 1961 in Burnie, Tasmania. Kerry married Michelle Louise Eleanor Young on 27 Apr 1985 in Launceston. Michelle was born on 10 Oct 1965. They had two children: Melissa Louise and Kayla Joy. 7-Melissa Louise Walker was born on 13 Jul 1988 in Burnie, Tasmania. 7-Kayla Joy Walker was born on 10 Sep 1991. 5-David Stanley Walker was born on 31 Aug 1942. David married Janice Elaine French. Janice was born on 4 Aug 1943. They had four children: Roslyn, Peter David, Philip Arthur and Garry Allan. 6-Roslyn Walker was born on 30 Mar 1965. Roslyn married David Dallas Orme. David was born on 17 Dec 1964. 6-Peter David Walker was born on 7 Apr 1967. Peter married Amanda. 6-Philip Arthur Walker was born on 5 Jun 1971. Philip married Carol. 6-Garry Allan Walker was born on 25 Oct 1980. 4-William Thomas Walker was born on 1 Aug 1906 in Riana and died in 1991 at age 85. He served in the Second World War. William married Pearl Frances Mason, daughter of Andrew William Mason and Sarah Jane Ratcliff, on 20 Apr 1929 in Ulverstone, Tasmania. Pearl was born on 11 Feb 1909 in Barrington, Tasmania. They had three children: Joan, Molly May and Judith Gaye. 5-Joan Walker was born on 7 May 1930. Joan married Neil Good. Neil was born on 2 Jun 1923. They had three children: Lynette, Bruce and Kerry. 6-Lynette Good was born on 5 Oct 1948. 6-Bruce Good was born on 29 Jul 1950. Bruce married Sharon Deverell. Sharon was born on 16 Sep 1956. They had two children: Nicholas and Adrianne. 7-Nicholas Good was born on 29 Jul 1980. 7-Adrianne Good was born on 15 Aug 1983. 6-Kerry Good was born on 10 Nov 1955. Kerry married Denise Pearce. Denise was born on 1 Jan 1959. They had two children: Lainie Jade and Ashlee Kate. 7-Lainie Jade Good was born on 6 Jan 1984. 7-Ashlee Kate Good was born on 8 Jul 1985. 5-Molly May Walker was born on 17 Feb 1934. Molly married Derek Upchurch Wise. Derek was born on 25 Jul 1931. They had three children: Dianne Maree, Helen May and Peter Norman. 6-Dianne Maree Wise was born on 1 Oct 1959. Dianne married Russell George Grice. Russell was born on 5 Dec 1957. They had two children: Aaron Luke and Megan. 7-Aaron Luke Grice was born on 22 Oct 1987. 6-Helen May Wise was born on 30 Apr 1961. Helen married Trevor Donald Brooks, son of Don Brooks and June Ling. Trevor was born on 9 Jun 1959. Helen next married Joseph Pawlasty. They had two children: Hannah May and Abbey Kate. 7-Hannah May Pawlasty was born on 18 Oct 1994 in Queensland. 7-Abbey Kate Pawlasty was born on 11 Nov 1996 in Burnie, Tasmania. 6-Peter Norman Wise was born on 3 Mar 1971. 5-Judith Gaye Walker was born on 8 Oct 1945. Judith married Desmond Gillam. Desmond was born on 30 May 1943. They had two children: Dean and Jan.
6-Dean Gillam was born on 25 Oct 1968. 6-Jan Gillam was born on 3 Feb 1971. 4-Stanley Samuel Walker was born on 3 Apr 1910 in Riana and died on 23 Dec 1981 at age 71. Stanley married Doris Emma Banham, daughter of Benjamin Banham and Lilyan Ling. Doris was born on 2 Apr 1913 in Penguin. They had four children: Margaret, Kathleen, Trevor and Allan. 5-Margaret Walker was born on 29 Sep 1936. Margaret married Athol Fielding. Athol was born on 31 Jul 1937. They had two children: Julie and Leonie. 6-Julie Fielding was born on 14 Aug 1956. Julie married Peter Johnson. Peter was born on 22 May 1956. They had three children: Corey, Jeremy and Naomi. 7-Corey Johnson was born on 29 Jan 1980. 7-Jeremy Johnson was born on 15 Dec 1982. 7-Naomi Johnson was born on 26 Mar 1983. 6-Leonie Fielding was born on 4 Jul 1960. Leonie married Michael Lucado Wells. Michael was born on 4 Jul 1960. They had one daughter: Haley. 7-Haley Wells was born on 4 Nov 1983. 5-Kathleen Walker was born on 1 Sep 1939. Kathleen married Ken Rogers. Ken was born on 3 Apr 1937. They had three children: Trudy, Christopher and Grant. 6-Trudy Rogers was born on 3 Jun 1964. Trudy married Ian Smith. Ian was born on 4 Aug 1968. 6-Christopher Rogers was born on 30 Aug 1968. 6-Grant Rogers was born on 3 Jul 1971. 5-Trevor Walker was born on 12 Oct 1942. Trevor married Ellie Deviers. Ellie was born on 6 Sep 1943. They had seven children: Rodney, Sharon, Jenny, Ruth, Darron, Stephen and Christine. 6-Rodney Walker was born on 10 Mar 1963. Rodney married Jacqueline Anne Fletcher. Jacqueline was born on 18 Jul 1966. 6-Sharon Walker was born on 19 May 1964. Sharon married Tony Yaxley. Tony was born on 7 Jul 1963. 6-Jenny Walker was born on 30 Apr 1965. 6-Ruth Walker was born on 2 May 1967. Ruth married Michael Hardy. Michael was born on 17 Oct 1963. 6-Darron Walker was born on 7 Aug 1969. 6-Stephen Walker was born on 21 Aug 1970. 6-Christine Walker was born on 7 Sep 1971. 5-Allan Walker was born on 1 Jun 1948. Allan married Lynette Ann Bryan. Lynette was born on 6 Nov 1949. They had three children: Michael, Vincent and Richard. 6-Michael Walker was born on 27 Oct 1974. 6-Vincent Walker was born on 28 Feb 1977. 6-Richard Walker was born on 7 May 1979.